I finally discovered the secrets on how Japanese restaurants can grow like mushrooms all over Hong Kong and yet still make tonnes of money. Simply implement a ticketing system and illogical, inefficient use of space in the restaurants. By 8.30 p.m. at night, you will be guaranteed a hordes of hungry and impatient diners waiting outside, ready to eat up a horse. That’s how I found myself tonight at Senryo at Hysan Place. It was close to nine p.m. before we were finally seated at the bar. I immediately ordered myself some hot sake and we settled in with some really tasty, gorgeous food… without looking at the price tags. I have been eyeing this snail (shellfish?) hungrily while waiting outside Senryo, and immediately got myself a portion while waiting for my sake. 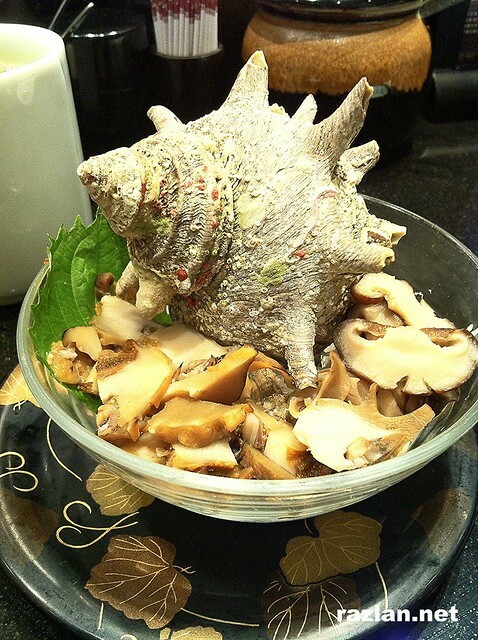 Slices of fresh snails with fragrant shitake mushroom were the perfect combi to go with their coarsely grinded wasabi. Thumbs up!